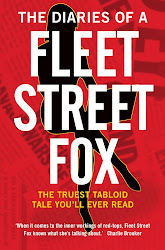 fleet street fox: The very definition of a farce. NEWSPAPERS in several countries not bound by an English injunction have identified on their pages a footballer who had an unreportable fling, but our media cannot show it. The subject of an injunction has issued court proceedings in the UK against the US owners of Twitter, but they are not bound to comply and it has served only to disseminate his story to millions more than if it had just been published in the first place. A journalist who named the subject of an injunction is facing contempt of court proceedings but cannot even be named himself under the rules of the original order even though he's accused of a crime, and a woman has been accused of blackmailing the subject of an injunction but barred from defending herself against the charge. What is or is not in the public interest cannot even be properly discussed in a public forum, and a series of silly shagging stories are ramping up into a constitutional crisis with Parliament going head-to-head with the judiciary. It's bizarre, it's ridiculous, and it's untenable. We have arrived at the point where the authorities here - like those in Egypt not so long ago - are realising that the millions who use social networks have more collective power than the media, the courts and Parliament put together. A barrister speaking about it yesterday referred to Twitter in scathing tones as "the mob" and said they should not be the ones to decide what is private and what is not. But the important thing about democracy is that the mob rules whether you like it or not. And in a fight I know whose side I'd be on. This has all come about because a few dozen people didn't have the wit to keep their trousers on. They are too stupid to realise that maintaining a good public reputation starts and ends with being honest - with themselves, with their families, and with the mob. Instead these fools are blaming other people for their indiscretions and being advised by very expensive lawyers to fritter six-figure sums in an exercise of futility when most people don't even care who they're shagging. Sue the internet? You may as well sue the ink a newspaper uses, or the sky for raining on you. These people don't need lawyers, they need a slap and they need it yesterday. Whether or not any of these stories were originally in the public interest was never debated before a judge imposed a gagging order stopping their revelation. The judge heard a solicitor say "our client has a right to respect for his privacy and family life under Article 8 of the Human Rights Act" and rubber-stamped it without question. The judge should have asked: "Does your client show a respect for his own privacy and family?" If he does, then injunct away. But if he has hawked his privacy, disrespected his wife and children, what right has he to demand that other people accord him that honour? He is simply dodging the consequences of his own actions, something our court system was set up to stop. I do not respect him, and nor does the mob. Privacy is a privilege as well as a right. We can all have it if we want it, but if we're to keep hold of it we have to accept its responsibilities and not squander it. So if you've got an injunction, here's a tip: lose it. Lose the lawyer, and ask him to pay back every penny he's taken off you. Lose the sense of entitlement which makes you think you deserve special treatment by the courts, something which was outlawed in England in 1354, for heaven's sake. Try being honest instead. It's the only way to end this farce and if you're very lucky the mob will love you for it. If you don't - well, mobs can get very ugly. Especially when it's them under attack.